Risk management « What Happened to the Portcullis? Enter SARS RCG Webpage here! This Friday, 20 April 2018, SARS Customs will implement its new Cargo, Conveyance and Goods Accounting solution – otherwise known as the Cargo Processing System (CPS). In recent years SARS has introduced several e-initiatives to bolster cargo reporting in support its electronic Customs Clearance Processing System (iCBS), introduced in August 2013. Followers of SARS’ New Customs Acts Programme (NCAP) will recognise that the CPS forms part of one of the three core pillars of the new legislative programme, better known as Reporting of Conveyances and Goods (RCG). The other two pillars are, Registration, Licensing and Accreditation (RLA) and Declaration Processing (DPR). More about these in future articles. In order to expedite the implementation of the new Acts, SARS deemed it necessary to introduce elements of the new functionality via a transitional manner under the current Customs and Excise (1964) Act. Proper revenue accounting and goods statistical reporting, can only be adequately achieved if Customs knows what goods ‘actually’ arrive, transit and exit it’s borders. Many countries, since the era of heightened security (post 9/11), have invested heavily in the re-engineering of policies and systems to address the threat of terrorism. This lead to a re-focus of resources and energies to develop risk management systems based on ‘advanced information’. SARS has invested significantly in automated systems in the last decade. Shortly, SARS it will also introduce a new automated risk engine with enhanced capabilities to include post clearance audit activities. It should also not come as a surprise to anyone conversant with Customs practice, that international Customs standards such as the WCO’s SAFE Framework of Standards, the RKC and the Data Model are prevalent in the new Customs legal dispensation and its operational business systems. South Africa will now follow several of its trading partners with the introduction of ‘advance reporting of containerised cargo’ destined for South African sea ports. This reporting requires carriers and forwarders to submit ‘advance loading notices’ to SARS Customs at both master and house bill of lading levels, 24 hours prior to vessel departure. The implementation of CPS is significant in terms of its scope. It comprises some 30 odd electronic cargo notices and reports across the sea, air, rail and road modalities. These reports form the ‘pipeline’ of information deemed necessary to ensure that the ‘chain of custody’ is visible and secure from point of departure to final destination. For the first time, South Africa will also require cargo reporting in the export domain. Download a high resolution map of SARS Cargo Report Messages here! It is no understatement that the CPS initiative is a challenge in particular to new supply chain entities who have not been required in the past to submit electronic reports. In order to meet these reporting requirements, a significant investment in systems development and training is required on the part of SARS and external trade participants. To this end, SARS intends to focus on ramping up compliance amongst all cargo reporters across all transport modalities. The first modality will be road, which is the most significantly developed and supported modality by trade since the inception of manifest reporting under the Customs Modernisation Programme. The remaining transport modalities will receive attention once road is stabilised. The recent WCO publication of a Study Report on E-Commerce is based on a short survey answered by the Organization’s Members. The Report compiles Customs administrations’ practices as well as their ongoing and/or future initiatives related to the processing of cross-border low-value e-commerce. Current practices, issues and challenges as well as initiatives and potential solutions are presented in each of the survey sections: Facilitation; Risk Management; Data Exchange/Cooperation with E-Commerce Operators; Control and Enforcement; Revenue Collection. Case studies are also widely used throughout the document to illustrate specific practices. The survey was undertaken as part of the WCO Work Plan on Cross-Border E-Commerce aimed at addressing cross-cutting issues in relation to e-commerce and coming up with practical solutions for the facilitated clearance of low-value shipments, including appropriate duty/tax collection mechanisms and control procedures. In December 2014 a WCO Capacity Building support mission was undertaken to Mozambique. The mission was the fourth in a series of inputs as part of the Project for “Customs Capacity Building for WCO Members 2012-15” which is funded by the Norwegian Agency for Development Cooperation (NORAD). The aim of the project is to deliver technical assistance to seven countries in specific areas of Customs operations. As one of the countries participating in the project the assistance provided to Mozambique has been designed to strengthen their capacity in the areas of Risk Management and Human Resources/Training Policy Management. The mission commenced with a meeting between the WCO delegation and Mr. Guilherme Mambo Director General, Customs. Progress with the project was discussed and specific plans for the introduction of new risk management procedures. The mission focused on the delivery of a high-level strategic Risk Management workshop. The workshop was designed to support the implementation of a new Risk Management Framework and was attended by several members of the MRA Senior Management Team. Together with the workshop, the WCO experts also conducted a Risk Management organizational review and prepared a report summarizing key findings and recommendations. Work also continued on supporting the MRA with the development of their new Strategic Plan and specifically with a review of existing risk profiles to ensure that they are aligned with the organization’s strategic objectives. At the invitation of the Comptroller-General of the Nigeria Customs Service (NCS), Mr. Abdullahi Dikko Inde, the WCO Secretary General Kunio Mikuriya visited Nigeria on 17 and 18 February 2014 to observe Customs transformation activities after the termination of Destination Inspection contracts on 1 December 2013. In Lagos, the Secretary General went to Apapa Port, Nigeria’s major port, to see Customs operations and also to visit the Customs Training Centre for a mentorship talk with young officers: the NCS has recruited many recent university graduates and trained them in computer and other necessary skills. Secretary General Mikuriya also presided over a Stakeholder Forum to interact with the private sector. The business community were supportive of the ongoing Customs transformation programme that was enhanced by an improved communication strategy for Customs, the use of information technology – the Nigeria Trade Hub – and the implementation of modern Customs methods, such as risk management. The private sector also suggested better use of a database for risk management purposes, including valuation, and expressed their hope for the introduction of coordinated border management and a Single Window to simplify the multiplicity of regulations and inspections at borders. The Secretary General also travelled to Abuja, Nigeria’s capital city, and was joined by three heads of Customs from neighbouring countries, namely Benin, Ghana and Niger, who wanted to learn from NCS’s experience and obtain Nigeria’s support, as well as that of the WCO, for terminating contracts with inspection companies in order to regain ownership of core Customs functions. A WCO workshop on the topics of Enforcement, Risk Management and Preferred Trader was conducted in April in Johannesburg, South Africa, with the involvement of the WCO Secretariat, UK Customs and the member countries of the Southern African Customs Union – SACU (Botswana, Lesotho, Namibia, South Africa and Swaziland). Capacity Building in the mentioned areas in the SACU Region is part of the WCO Sub-Saharan Customs Capacity Building Programme financed by the Swedish Government through the Swedish International Development Cooperation Agency, SIDA. An assessment including lessons learned was conducted concerning Operation Auto, targeted at second hand motor vehicles. This first ever regional enforcement operation in the 102 years of history of SACU presented good results as around 250 vehicles were seized by the Customs administrations. The Regional Intelligence Liaison Office contributed actively in the assessment process, ensuring that also future enforcement operations will benefit from the experiences gained. The development of further risk management capacity is ongoing at the regional level and discussions were held concerning the establishment of common risk profiles. A number of high risk products have been identified and the formulation of profiles to engage illegal trade in these areas is ongoing. So how come FTZs, IDZs, EPZs, etc are working in other African countries and not here in South Africa? This Day Live (Nigeria) offers some of the critical success factors which delineate such zones from the normal economic operations in a country. Are we missing the boat? The extent of economic and incentive offering can vary substantially between the different economic and trade zone models – some extremely liberal while others tend to the conservative. Obviously the more liberal and free the regulations are the more stringent the ‘guarantees’ and controls need to be. However, in today’s e-commercial world, risk to revenue can more than adequately be mitigated and managed with through risk management systems. Manufacturing and logistical supply chain operations are likewise managed in automated fashion. I guess the real issue lies in governments appetite for risk and more particularly its willingness to relax tax and labour laws within such zones. Furthermore, a sound economic roadmap demonstrating backward linkages to the local economy and outward linkages to international markets must be defined. Herein lies some of the difficulties which have plagued South African attempts at such economic offerings – no specific economic (export specific) goals. Limited financial/tax incentives for investors, and poor cooperation between the various organs of state to bring about a favourable investment climate. A clearly delimited and enclosed area of a national customs territory, often at an advantageous geographical location, with an infrastructure suited to the conduct of trade and industrial operations and subject to the principle of customs and fiscal segregation. A clearly delineated industrial estate, which constitutes a free trade enclave in the customs and trade regime of a country, and where foreign manufacturing firms, mainly producing for export, benefit from a certain number of fiscal and financial incentives. Industrial zones with special incentives set up to attract foreign investors, in which imported materials undergo some degree of processing before being re-exported. Creating jobs and income: one of the foremost reasons for the establishment of FTZs is the creation of employment. Generating foreign exchange earnings and attracting foreign direct investment (FDI): measures designed to influence the size, location, or industry of a FDI investment project by affecting its relative cost or by altering the risks attached to it through inducements that are not available to comparable domestic investors are incentives to promoting FDI. Implicit in this statement lies the definition of FTZ. Other traits that are recognizable when discussing FDI’s include specially negotiated fiscal derogations, grants and soft loans, free land, job training, employment and infrastructure subsidies, product enhancement, R&D support and ad hoc exceptions and derogations from regulations. In addition to FDI, by promoting non-traditional exports, increased export earnings tend to have a positive impact on the exchange rate. Transfer of technology: trans-national corporations (TNCs) are a dominant source of innovation and direct investment by them is a major mode of international technology transfer, possibly contributing to local innovative activities in host countries. It is a government’s primary obligation to its citizenry to provide attractive technology, innovative capacities and mastering, upgrading, and diffusing them throughout the domestic economy. Nevertheless, through national policies, international treaty making, market-friendly approaches, a host country gravitates from providing an enabling environment to stronger pro-innovation regimes that perpetually encourage technology transfer. FTZs can be both publicly (i.e. government) and or privately owned and managed. Governments own the more traditional older zones, which tend to focus more on policy goals that are primarily socio-economic. 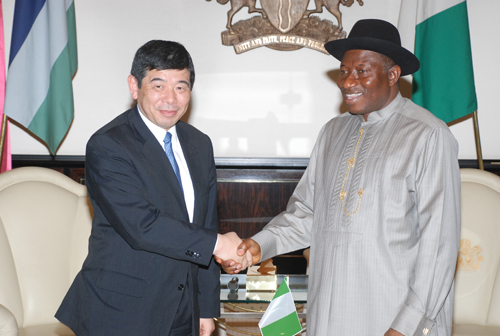 They emphasize industry diversification, attracting FDI, job creation and the like. Privately-owned FTZs have the advantage of eliminating government bureaucracy, are more flexible, and are better prepared to deal with technological changes. The global trend towards privatization has made privately-run zones more popular and a number are highly successful. The role of government in the case of privately-run zones is to provide a competitive legal framework with attractive incentive packages that meet the World Trade Organization (WTO) requirements. A new online system being implemented by the Common Market for Eastern and Southern Africa (Comesa) trading bloc is expected to cut down non-tariff barriers, reduce the cost of doing business and improve intra-regional trade. The $1 million (Sh84 million) system – which is being developed by Comesa and funded by the European Union – could for instance cut transport costs by up to 40 per cent, Comesa secretary-general Sindiso Ngwenya said. 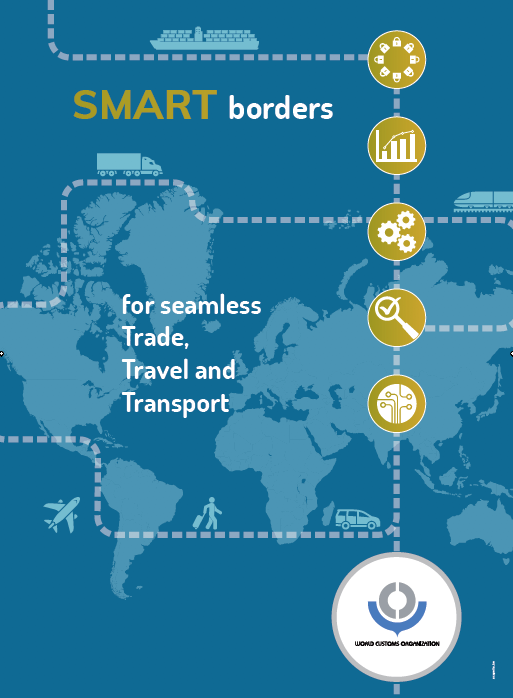 With three main modules – Transit Bonds, Risk Management and Cargo Tracking — the Comesa Virtual Trade Facilitation System (CVTFS) aims at integrating systems used by regional revenue authorities, transporters, shippers, clearing agents, ports and customs to provide real-time information and facilitate uninterrupted movement of goods across borders. Besides tracking cargo from origin to destination, the system will facilitate management of transit bonds and capture electronic data contained in the customs seal and assign this information to customs offices at various transit points. Comesa has already gazetted transit goods routes which have been geo-fenced and trucks following these routes will be monitored. In case seals are tampered with, owners will automatically be notified via Short Message Services (SMSs) or email. Owners who register their trucks with the system will display a ‘Comesa Transit’ plate on their vehicles. Delays along the major transport corridors arising from lengthy procedures at weight control points and police road blocks within the region have been identified as major non-tariff barriers hindering trade. Mr Charles Muita, a member of the team that worked on the system and who made the presentation, said they expected most of the countries where industry players do not have their own systems to quickly adopt CVTFS. “The system does not intend to replace the ones used by member countries but would integrate them to achieve a seamless flow of information and documentation,” Mr Ngwenya said during the sensitisation at the Mombasa Beach Hotel. Truckers buy the fleet management system at Sh24,000 and pay an average of Sh2,000 management fee per month.“We are not interested in making money with the system and the initial cost of the gadget will be less than Sh12,000 and a monthly management fee of about $3 (Sh255),” explained Mr Ngwenya. 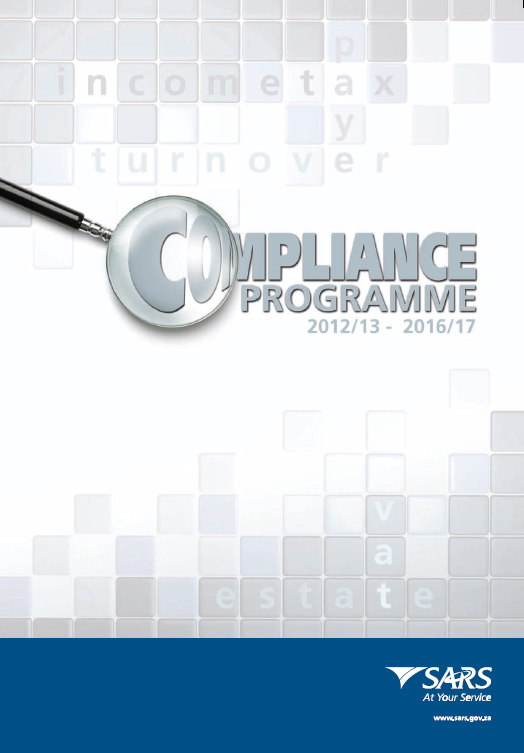 SARS has issued its inaugural SARS Compliance Programme, a high-level overview of its plans for the next five years to further grow compliance with tax and customs legislation. More so than perhaps any other time in history, the current global economic conditions have thrust domestic resource mobilisation into the spotlight, highlighting sustainability built on a foundation of tax compliance. Countries lacking this solid base have found their room for manoeuvre in these uncertain times severely curtailed and, in some cases, completely absent. The impact of self-reliance on self-determination is self-evident. Illicit cigarettes: the trade in and consumption of illicit cigarettes is detrimental to the fiscus and to the health of South Africans. SARS interventions will continue to focus on clamping down on cigarettes smuggled via warehouses as well the diversion of cigarettes destined for export back into the local market. SARS also plans to modernise it’s warehousing management and acquittal system. Undervaluation of imports in the clothing and textile industry: Undervalued imports pose a significant risk not only to the fiscus but to local industry and job creation. SARS will continue to work together with other government agencies and industry stakeholders to clamp down on this practice including through the establishment and frequent revision of a reference pricing database to detect undervaluation, increasing inspections as well as supporting an integrated border management model. Tax Practitioners and Trader Intermediaries: Regulation of this industry will be pursued to ensure that tax practitioners and trade intermediaries are all persons of good standing, are fully tax compliant in their personal capacity and provide a high quality service and advice to their clients. 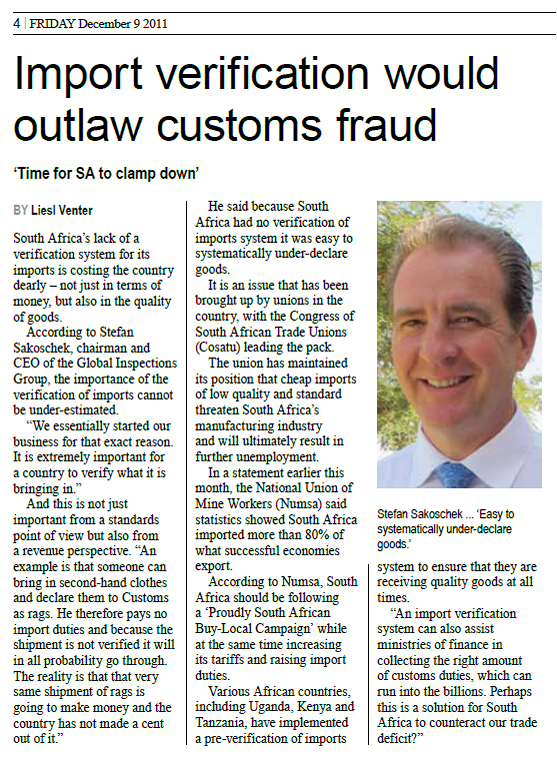 SARS will also develop a rigorous risk profiling system to identify high risk practitioners and trade intermediaries. Having considered that commonality and harmonisation in Customs lies more in data and less in format, it is nevertheless still important to consider the state and readiness of all customs administrations, particularly where the innovation of one effects another. The biggest issue with technology-lead modernisation lies in the fact that an IT solution delivers, in most instances, ‘intangible’ characteristics – not always possible to feel, to touch, or to understand. Little wonder then customs users and traders are bewildered if not a bit confused with the resulting ‘change’ at first. The burden to manage such ‘change’ often lies with staff who have limited understanding of the technology and limited time to ‘educate’ the user. 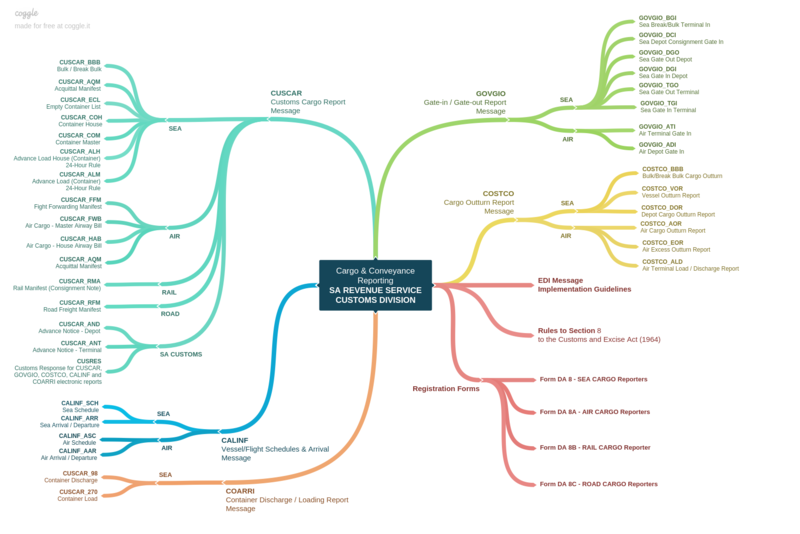 And, on the import/export trading front as I have mentioned before, there is an increasing tendency or responsibility among’st service providers to provide relevant training. For the customs official, what once represented a semblance of control, of influence, is rendered obsolete. For instance, the introduction of automated workflow – which effectively drives the customs process according to specified functions attached to configurable user profiles – manages and monitor’s the user’s activities and performance. This dramatically increases the organisation’s ability to review and report on individuals, branch teams, and regional performance. In SARS’ case, the new software solution mimics the look an feel of organic items such as documents and forms. Barcodes now replace official customs stamps (yes, those rubber things that once indicated official approval), and the combination of automated risk management coupled with structured workflow virtually eliminates discretion – discretion now limited to drop-down menus and tick box options. To address the impact of innovation on the customs and supply chain process, a communication strategy is vital. Any change which dramatically reduces turnaround and response times on one side of a land border crossing fundamentally impact the activities on the other side – its simple algebra: what you do to the one side you ought to do to the other. What purpose does modernisation serve if it benefits trade only partially? Regional cooperation therefore behoves the initiating party to facilitate and assist neighbours in refining the overall border processing experience, benefiting all. Recently, regional endeavours on information exchange and cross-border harmonisation have gained traction. With all the political overturing concerning intra-African trade, the creation of broader free trade areas, and the realisation that all of this can only succeed with a combined regional effort, Africa Customs is certainly attempting to address its own past barriers and limitations. Korea’s Client-oriented Logistics Information System which automatically measures the time taken for processing imported cargo at each stage of clearance from arrival at port to release (arrival at port > bonded warehouse > import declaration > permission > release), to diagnose and eliminate bottlenecks in logistics. TradeFIRST, Singapore Customs’ latest initiative to improve trade facilitation through better partnerships with business. TradeFIRST is a single trade facilitation window that integrates the concepts of facilitation, compliance and risk management, and promises to make trade easier, fairer and more secure. The concept of multi-layered security.